The third of my crop of books out this month is Russian Political War: moving beyond the hybrid from Routledge, a study of what I think we should be talking about instead of ‘hybrid war’ (let alone the mythical ‘Gerasimov Doctrine‘). It builds off my earlier report, Hybrid War or Gibridnaya Voina? to argue that while the Russian military – like everyone else – is looking at the opportunities in non-kinetic means to prepare the battlefield (after all, has any war not been ‘hybrid’? ), the real challenge the West faces is different. The current campaign being waged against the West is not a preparation for eventual military conflict, but rather a wholly non-military campaign that echoes ‘political war’ as described by George Kennan at the start of the Cold War, and which has its spiritual home and command and control centre within the Presidential Administration and Russia’s civilian national security elites. One of my regrets of 2017 was, for reasons beyond my control, not getting to speak at the Yeltsin Centre in Ekaterinburg. I confess I am not the greatest fan of Yeltsin-the-Man – for all his successes bringing down the USSR and crushing some of its more unpleasant remnants, he was a destroyer rather than a creator, and as Tony Wood trenchantly demonstrates in his Russia Without Putin, in many ways Putin is an heir not just to the failures of the 1990s but also the policies. Nonetheless, the Yeltsin Centre appears committed to the best ideals of Yeltsin-the-Symbol in hosting a series of very interesting lectures, especially on the social and political processes shaping Russia and the world. Recently the indefatigable Ekaterina Schulmann – whom every serious Russia-watcher should follow – delivered a fascinating lecture on the evolution of Russian society, and fortunately Znak has published a detailed summary of her comments. There is much in the lecture to explore and enjoy, and I will not try and do it full justice. Rather, what I want to focus on is her core point, that especially since 2014, Russia has been moving towards what Westerners might consider ‘normalcy,’ with less of the atomisation, survivalism and dependence on state institutions that has so consistently dogged Russian politics and society. 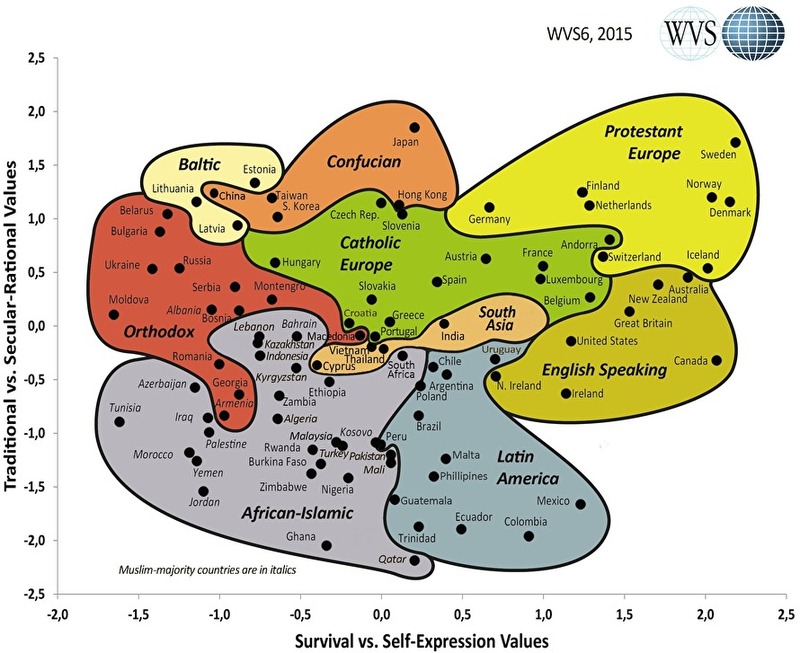 In terms of the global values map reproduced below, the country is slowly but surely moving to the right. We do not need to make a new revolution to improve our lives. We have a really low quality of public administration, but it is sub-standard relative to our level of social development. We are at heart a healthy society. We are an urban country: 74.4% of our fellow citizens live in cities. Our literacy rate is 99%, and more than half of the population has a higher than average education. In this sense, we are at the level of Israel and Canada. Most of our fellow citizens are not engaged in physical labour. We even have a falling prison population. We could have a political system which suits us more, life could be much better without any revolutionary upheavals. The authorities should meet society’s needs, and the society does not need mass repressions, control over public space, censorship, or bans on meetings – none of this is needed. This is just unnecessary. In fact, the simple observance of the Constitution and the rolling back of the repressive measures of 2012-14 will give us, without any grand struggles and huge sacrifices, a much more responsive political system. People want to be listened to, people want political participation and competition. They want to go to rallies and not get their skulls cracked by the National Guard, they want to go to vote and see candidates who represent them on the ballots. People want a party system that meets their needs, people want a public sphere, in which they can talk about what matters to them, not the ‘crimes of the Kyiv junta’ committed some year or other. We are closer to normal than we ourselves think. Our ideas about fears of a disastrous future are based on nothing. 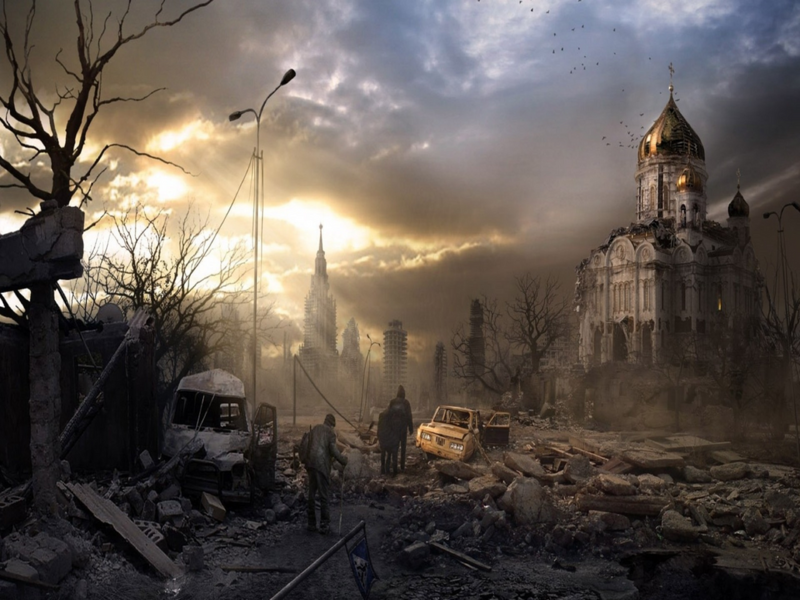 Apocalyptic expectations, which, of course, are also pushed by the state-run media, do not conform to reality. It does not mean from this that nothing bad could happen to us. It could – and that would be even more painful, because then there would have been no rhyme or reason, it would just have come out of the blue, and for nothing. It could have been different and it could have been much better. Of course, saying Russia ‘just’ needs the Constitution upheld and Putin’s recent repressive counter-proto-revolutionary measures rolled back is a little like saying the economy ‘just’ needs rule of law and an end to corruption – easy to say, not so easy to do. But this is an absolutely crucial point. For all the arbitrary authoritarianism and capricious kleptocracy of the Putin years, this has coexisted with a too-often-unsung process of social development, even a still-unfinished but not insignificant degree of legalism. It may take years, it may take political generations, but the foundations for a process of democratisation, liberalisation, normalisation, Westernisation, whatever one wants to call it, are there. And this is, of course, a challenge for the Kremlin and the upper levels of the elite whose power and privilege depends upon it. While he may not – probably does not – think of it in these terms, much of what Putin does these days is, if not to reverse this process, to obscure it. The increasingly paranoid quest for fifth, sixth (seventh?) columnists at home, the rabid and xenophobic propaganda too visible on state TV, the presentation of the world as a hostile place, committed to keeping Russia bound and subordinated, all of these are distractions. But the good news is that the very reason why the volume and pitch of these distractions is getting greater and greater is that it has at best limited impact. Russians are still organising and forming bonds of social cohesion, they are supplementing the TV’s vision of the world with one they gather on the internet or through personal experience, they pin on a St George’s ribbon on Victory Day but have no willingness to see blood and treasure expended in Syria, Venezuela and, probably, the Donbas. A normal society and an abnormal regime. For now, the latter gets the airtime, but in the long term, the former will win out. On Guard For The Defence Of The Motherland! Time for a Saturday spleen-venting. It’s always dangerous to predict that we’ve reached “peak” anything, because life will no doubt find a way to prove you wrong. But I truly with that a story in today’s Times could turn out to be peak…I don’t even know quite what to call it…cliché Russophobia. This is just one of a steady trickle of bizarre stories relating to Russia’s Machiavellian genius in weaponising everything. Remember those football hooligans who were somehow part of Putin’s ‘hybrid war’? Of course Russia is launching a active measures campaign against the West, but shoddy pieces like this that suggest that anything demonstrating that the Russians themselves are human beings like us, that their kids watch TV cartoons like us, that their hot-headed young men can get violent in support of their teams and in mutual displays of machismo like ours, that they live and love, dream and die like us, is somehow ‘soft propaganda,’ is depressing to the nth degree. It’s also a problem. Why? It devalues the real propaganda. Of course Russia is maintaining a soft power campaign to try and influence foreign perceptions, ranging from presenting Putin as some kind of bare-chested champion of traditional values, to suggesting that the Europeans are being coerced into sanctions and other anti-Kremlin moves by an overweening America. Just as to defend all is to defend nothing, so too to see everything coming from Russia as propaganda is to make it impossible to make a serious case when it really is. It devalues us. When did it become necessary to dehumanise the Russians, to have to pretend that everything in and from Russia is evil, in order to critique and resist Putin’s regime? First of all, this – I would say – flies in the face of our own liberal world view. It helps Putin. Secondly, it is bad politics, it plays to Putin’s own legitimating narrative, that the West hates Russia and Russians, and that is why they need a strong state and a strong leader. Let’s not overplay the sloppiness. Sure, in hindsight it is always easy to see what was done wrong, just like every inquest after every tragedy, disaster or intelligence failure concludes that they were avoidable. That’s like saying every student could have passed an exam, if they had given the right answers: true but meaningless. Every service makes mistakes, and the GRU has, and if – as the Russians are – you’re operating at flat-out tempo, you’re going to make even more mistakes. Yes, there was some clearly sloppy tradecraft (though still the revelation of 305 GRU officers’ details in Moscow because they registered their cars at their unit’s address was arguably the biggest such breach), but keep it in perspective. And let’s not overplay any ‘purge.’ There is no evidence the GRU has been operating beyond Kremlin orders, none of the kind of paralysis that, for example, followed the Nemtsov murder. If Putin is showing his anger, it is not because they are spying and hacking and killing, but because they are not doing it well enough. Any purge would be for political purposes (to help distance the Kremlin from these operations) and also to encourage greater professionalism. 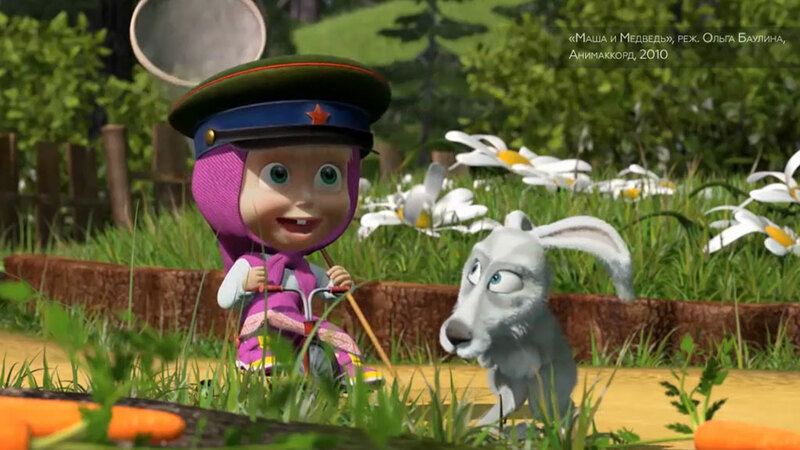 *Yes, I know that since 2010 it’s technically the GU, but everyone, even in the Russian military, still calls it GRU. It’s one of those MI6/SIS things. Everyone who is serious about Russian studies knows about the indispensable Johnson’s Russia List, a daily mailshot of a collection of the day’s relevant English-language stories, good, bad, and sometimes ugly. I may sometimes cavil at David Johnson’s determination to include a – to me – disproportionate selection of determinedly ‘counter-mainstream’ bloggers determined to find anti-Kremlin conspiracy at every turn, but one of the List‘s great virtues is precisely to puncture those comforting bubbles of consensus with which it is so easy to surround ourselves. We can be surprised. And good heavens, I was surprised by a piece in the latest, ‘Putin is Here to Stay, and the Russian State Will Die with Him,’ by one Brandon J. Weichert in the American Thinker of 8 September. I confess I don’t know Mr Weichert, nor for that matter more than the name of the American Thinker. I have no idea if it is considered a purveyor of fringe nonsense or a serious intellectual powerhouse. I have my suspicions which is more likely. I could go and google it, but frankly I was more fascinated – entranced – horrified by the analysis put forward. Any political leader meeting another is seeking to get something out of the exchange, whether a specific deliverable or simply developing the relationship. In this respect, the Helsinki summit will be no different from any other. What makes it more noteworthy is the personalities of the two interlocutors and that one was trained to recruit and run assets – and the other seems almost custom-built to be managed and manipulated. Of course one can push the fact that Putin was a KGB case officer too far. Not every KGB officer is the same, it was a long time ago, and by all accounts he was at best an adequate one. He was not a high-flier, and former foreign intelligence chief and then KGB chairman Vladimir Kryuchkov once tellingly said that he had never heard of Putin when he was in service. Nonetheless, when Putin said that his particular talent was “working with people,” there is more than a little truth in that. He has managed his own elites very effectively, and also has had considerable successes framing relations with other leaders, as well as leveraging his carefully-created ruthless, cool, macho image.